"Arrow War" redirects here. For the Korean film, see War of the Arrows. 1 The U.S. was officially neutral, but later aided the British in the Battle of the Barrier Forts (1856) and the Battle of Taku Forts (1859). 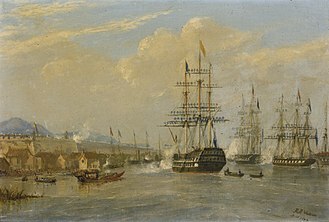 The Second Opium War (Chinese: 第二次鴉片戰爭; pinyin: Dì èr cì yāpiàn zhànzhēng), the Second Anglo-Chinese War, the Second China War, the Arrow War, or the Anglo-French expedition to China, was a war pitting the United Kingdom and the French Empire against the Qing dynasty of China, lasting from 1856 to 1860. The terms "Second War" and "Arrow War" are both used in literature. "Second Opium War" refers to one of the British strategic objectives: legalizing the opium trade, expanding trade, opening all of China to British merchants, and exempting foreign imports from internal transit duties. The "Arrow War" refers to the name of a vessel which became the starting point of the conflict. The war followed on from the First Opium War. In 1842, the Treaty of Nanking—the first of what the Chinese later called the unequal treaties—granted an indemnity and extraterritoriality to Britain, the opening of five treaty ports, and the cession of Hong Kong Island. 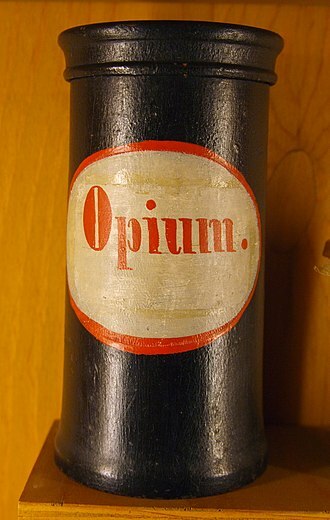 The failure of the treaty to satisfy British goals of improved trade and diplomatic relations led to the Second Opium War (1856–60). In China, the First Opium War is considered to be the beginning of modern Chinese history. The 1850s saw the rapid growth of Western imperialism. Some of the shared goals of the western powers were the expansion of their overseas markets and the establishment of new ports of call. The French Treaty of Huangpu and the American Wangxia Treaty both contained clauses allowing renegotiation of the treaties after 12 years of being in effect. In an effort to expand their privileges in China, Britain demanded the Qing authorities renegotiate the Treaty of Nanking (signed in 1842), citing their most favoured nation status. The British demands included opening all of China to British merchant companies, legalising the opium trade, exempting foreign imports from internal transit duties, suppression of piracy, regulation of the coolie trade, permission for a British ambassador to reside in Beijing and for the English-language version of all treaties to take precedence over the Chinese language. To give Chinese merchant vessels operating around treaty ports the same privileges accorded to British ships by the Treaty of Nanking, British authorities granted these vessels British registration in Hong Kong. In October 1856, Chinese marines in Canton seized a cargo ship called the Arrow on suspicion of piracy, arresting twelve of its fourteen Chinese crew members. The Arrow had previously been used by pirates, captured by the Chinese government, and subsequently resold. It was then registered as a British ship and still flew the British flag at the time of its detainment, though its registration had expired. Its captain, Thomas Kennedy, who was aboard a nearby vessel at the time, reported seeing Chinese marines pull the British flag down from the ship. The British consul in Canton, Harry Parkes, contacted Ye Mingchen, imperial commissioner and Viceroy of Liangguang, to demand the immediate release of the crew, and an apology for the alleged insult to the flag. Ye released nine of the crew members, but refused to release the last three. On 23 October the British destroyed four barrier forts. On 25 October a demand was made for the British to be allowed to enter the city. Next day the British started to bombard the city, firing one shot every 10 minutes. Ye Mingchen issued a bounty on every British head taken. On 29 October a hole was blasted in the city walls and troops entered, with a flag of the United States being planted by James Keenan (U.S. Consul) on the walls and residence of Ye Mingchen. Losses were 3 killed and 12 wounded. Negotiations failed and the city was bombarded. On 6 November, 23 war junks attacked and were destroyed. There were pauses for talks, with the British bombarding at intervals, fires were caused, then on 5 January 1857, the British returned to Hong Kong. The British government lost a Parliamentary vote regarding the Arrow incident and what had taken place at Canton to the end of the year on 3 March 1857. Then there was a general election in April 1857 which increased the government majority. In April, the British government asked the United States of America and Russia if they were interested in alliances, the offers were rejected. In May 1857, the Indian Mutiny became serious. British troops destined for China were diverted to India, which was considered the priority issue. The execution of the Paris Foreign Missions Society missionary Auguste Chapdelaine was the official cause of the French involvement in the Second Opium War. France joined the British action against China, prompted by complaints from their envoy, Baron Jean-Baptiste Louis Gros, over the execution of a French missionary, Father Auguste Chapdelaine, by Chinese local authorities in Guangxi province, which at that time was not open to foreigners. The British and the French joined forces under Admiral Sir Michael Seymour. The British army led by Lord Elgin, and the French army led by Gros, together they attacked and occupied Canton (Guangzhou) in late 1857. A joint committee of the Alliance was formed. The Allies left the city governor at his original post in order to maintain order on behalf of the victors. The British-French Alliance maintained control of Canton for nearly four years. The coalition then cruised north to briefly capture the Taku Forts near Tientsin (now known as Tianjin) in May 1858. The United States and Russia sent envoys to Hong Kong to offer military help to the British and French, though in the end Russia sent no military aid. 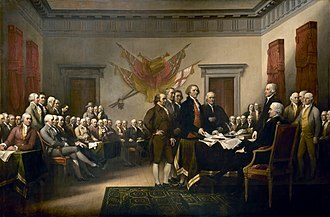 The U.S. was involved in a minor concurrent conflict during the war, although they ignored the UK's offer of alliance and did not coordinate with the Anglo-French forces. In 1856, the Chinese garrison at Canton shelled a United States Navy steamer; the U.S. Navy retaliated in the Battle of the Pearl River Forts. The ships bombarded then attacked the river forts near Canton, taking them. Diplomatic efforts were renewed afterward, and the American and Chinese governments signed an agreement for U.S. neutrality in the Second Opium War. Despite the U.S. government's promise of neutrality, the USS San Jacinto aided the Anglo-French alliance in the bombardment of the Taku Forts in 1859. The remaining crew of the Arrow were then released, with no apology from Viceroy Ye Mingchen who also refused to honour the treaty terms. Seymour, Major General van Straubenzee and Admiral de Genouilly agreed the plan to attack Canton as ordered. :503 This event came to be known as the Arrow Incident and provided the alternative name of the ensuing conflict. 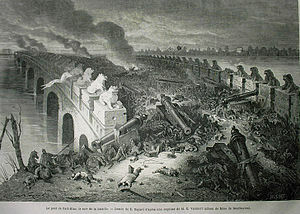 The capture of Canton, on 1 January 1858, a city with a population of over 1,000,000 by less than 6,000 troops, resulted in the British and French forces suffering 15 killed and 113 wounded. 200–650 of the defenders and inhabitants became casualties. Ye Mingchen was captured and exiled to Calcutta, India, where he starved himself to death. Although the British were delayed by the Indian Rebellion of 1857, they followed up the Arrow Incident in 1856 and attacked Guangzhou from the Pearl River. Viceroy Ye Mingchen ordered all Chinese soldiers manning the forts not to resist the British incursion. 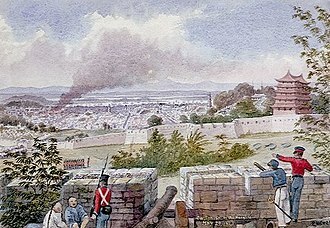 After taking the fort near Guangzhou with little effort, the British Army attacked Guangzhou. Meanwhile, in Hong Kong, there was an attempt to poison John Bowring and his family in January. However, the baker who had been charged with lacing bread with arsenic bungled the attempt by putting an excess of the poison into the dough, such that his victims vomited sufficient quantities of the poison that they had only a non-lethal dose left in their system. Criers were sent out with an alert, preventing further injury. That this House has heard with concern of the conflicts which have occurred between the British and Chinese authorities on the Canton River; and, without expressing an opinion as to the extent to which the Government of China may have afforded this country cause of complaint respecting the non-fulfilment of the Treaty of 1842, this House considers that the papers which have been laid on the table fail to establish satisfactory grounds for the violent measures resorted to at Canton in the late affair of the Arrow, and that a Select Committee be appointed to inquire into the state of our commercial relations with China. In response, Lord Palmerston attacked the patriotism of the Whigs who sponsored the resolution and Parliament was dissolved, causing the British general election of March 1857. The Chinese issue figured prominently in the election, and Palmerston won with an increased majority, silencing the voices within the Whig faction who supported China. The new parliament decided to seek redress from China based on the report about the Arrow Incident submitted by Harry Parkes. The French Empire, the United States, and the Russian Empire received requests from Britain to form an alliance. In June 1858, the first part of the war ended with the four Treaties of Tientsin, to which Britain, France, Russia, and the U.S. were parties. These treaties opened 11 more ports to Western trade. The Chinese initially refused to ratify the treaties. On 28 May 1858, the separate Treaty of Aigun was signed with Russia to revise the Chinese and Russian border as determined by the Nerchinsk Treaty in 1689. Russia gained the left bank of the Amur River, pushing the border south from the Stanovoy mountains. A later treaty, the Convention of Peking in 1860, gave Russia control over a non-freezing area on the Pacific coast, where Russia founded the city of Vladivostok in 1860. On 20 May the First Battle of Taku Forts was successful, but the peace treaty returned the forts to the Qing army. In June 1858, shortly after the Qing imperial court agreed to the disadvantageous treaties, hawkish ministers prevailed upon the Xianfeng Emperor to resist Western encroachment. On 2 June 1858, the Xianfeng Emperor ordered the Mongol general Sengge Rinchen to guard the Taku Forts (also romanized as Ta-ku Forts and also called Daku Forts) near Tianjin. Sengge Rinchen reinforced the forts with additional artillery pieces. He also brought 4,000 Mongol cavalry from Chahar and Suiyuan. The Second Battle of Taku Forts took place in June 1859. 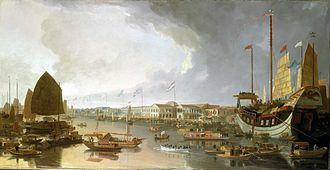 A British naval force with 2,200 troops and 21 ships, under the command of Admiral Sir James Hope, sailed north from Shanghai to Tianjin with newly appointed Anglo-French envoys for the embassies in Beijing. They sailed to the mouth of the Hai River guarded by the Taku Forts near Tianjin and demanded to continue inland to Beijing. Sengge Rinchen replied that the Anglo-French envoys might land up the coast at Beitang and proceed to Beijing but he refused to allow armed troops to accompany them to the Chinese capital. The Anglo-French forces insisted on landing at Taku instead of Beitang and escorting the diplomats to Beijing. On the night of 24 June 1859, a small batch of British forces blew up the iron obstacles that the Chinese had placed in the Baihe River. The next day, the British forces sought to forcibly sail into the river, and shelled the Taku Forts. Low tide and soft mud prevented their landing, however, and accurate fire from Sengge Rinchen's cannons sank four gunboats and severely damaged two others. American Commodore Josiah Tattnall, although under orders to maintain neutrality, declared "blood is thicker than water," and provided covering fire to protect the British convoy's retreat. The failure to take the Taku Forts was a blow to British prestige, and anti-foreign resistance reached a crescendo within the Qing imperial court. Once the Indian Mutiny was finally quelled, Sir Colin Campbell, commander-in-chief in India, was free to amass troops and supplies for another offensive in China. A 'soldiers' general', Campbell's experience of casualties from disease in the First Opium War led him to provide the British forces with more than enough materiel and supplies, and casualties were light. The Third Battle of Taku Forts took place in the summer of 1860. 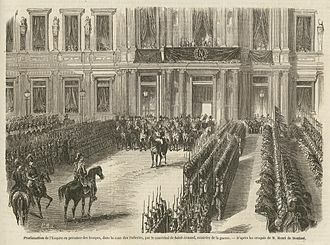 London once more dispatched Lord Elgin with an Anglo-French force of 11,000 British troops under General James Hope Grant and 6,700 French troops under General Cousin-Montauban. They pushed north with 173 ships from Hong Kong and captured the port cities of Yantai and Dalian to seal the Bohai Gulf. On 3 August they carried out a landing near Beitang (also romanized as "Pei-t'ang"), some 3 kilometres (1.9 mi) from the Taku Forts, which they captured after three weeks on 21 August. 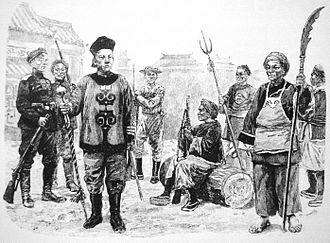 Southern Chinese laborers served with the French and British forces. One observer reported that the "Chinese coolies", as he called them, "renegades though they were, served the British faithfully and cheerfully... At the assault of the Peiho Forts in 1860 they carried the French ladders to the ditch, and, standing in the water up to their necks, supported them with their hands to enable the storming party to cross. It was not usual to take them into action; they, however, bore the dangers of a distant fire with great composure, evincing a strong desire to close with their compatriots, and engage them in mortal combat with their bamboos." After taking Tianjin on 23 August, the Anglo-French forces marched inland toward Beijing. The Xianfeng Emperor then dispatched ministers for peace talks, but the British diplomatic envoy, Harry Parkes, insulted the imperial emissary and word arrived that the British had kidnapped the prefect of Tianjin. Parkes was arrested in retaliation on 18 September. Parkes and his entourage were imprisoned and interrogated. Half were reportedly executed by slow slicing, with the application of tourniquets to severed limbs to prolong the torture. This infuriated British leadership when they recovered the unrecognizable bodies. 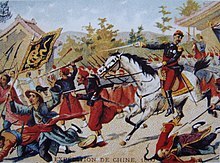 The Anglo-French forces clashed with Sengge Rinchen's Mongol cavalry on 18 September near Zhangjiawan before proceeding toward the outskirts of Beijing for a decisive battle in Tongzhou (also romanized as Tungchow). On 21 September, at Baliqiao (Eight Mile Bridge), Sengge Rinchen's 10,000 troops, including the elite Mongol cavalry, were annihilated after doomed frontal charges against concentrated firepower of the Anglo-French forces, which entered Beijing on 6 October. With the Qing army devastated, the Xianfeng Emperor fled the capital and left behind his brother, Prince Gong, to take charge of peace negotiations. Xianfeng first fled to the Chengde Summer Palace and then to Rehe Province. Anglo-French troops in Beijing began looting the Summer Palace (Yiheyuan) and Old Summer Palace (Yuanmingyuan) immediately (as they were full of valuable artwork). After Parkes and the surviving diplomatic prisoners were freed on 8 October, Lord Elgin ordered the Summer Palaces to be destroyed, starting on 18 October. Beijing was not occupied; the Anglo-French army remained outside the city. The destruction of the Forbidden City was discussed, as proposed by Lord Elgin to discourage the Qing Empire from using kidnapping as a bargaining tool, and to exact revenge on the mistreatment of their prisoners. Elgin's decision was further motivated by the torture and murder of almost twenty Western prisoners, including two British envoys and a journalist for The Times. The Russian envoy Count Ignatiev and the French diplomat Baron Gros settled on the burning of the Summer Palaces instead, since it was "least objectionable" and would not jeopardise the signing of the treaty. Second China War Medal, with Taku Forts 1860 bar. French medal of the China Campaign ("Médaille de la Campagne de Chine"), 1861, in the Musée de la Légion d'Honneur. The Chinese characters inscribed on the ribbons read 'Beijing'. Both Britain (Second China War Medal) and France (Commemorative medal of the 1860 China Expedition) issued campaign medals. 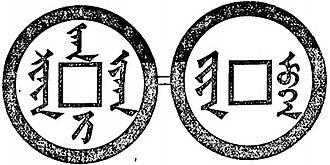 The British medal had the following clasps: China 1842, Fatshan 1857, Canton 1857, Taku Forts 1858, Taku Forts 1860, Peking 1860. Qing flag seized by Anglo-French forces. The flag reads "親兵第五隊右營": Bodyguard, fifth squadron, right battalion (unit types are approximate). Les Invalides. After the Xianfeng Emperor and his entourage fled Beijing, the June 1858 Treaty of Tianjin was ratified by the emperor's brother, Prince Gong, in the Convention of Beijing on 18 October 1860, bringing The Second Opium War to an end. The British, French and—thanks to the schemes of Ignatiev—the Russians were all granted a permanent diplomatic presence in Beijing (something the Qing Empire resisted to the very end as it suggested equality between China and the European powers). The Chinese had to pay 8 million taels to Britain and France. Britain acquired Kowloon (next to Hong Kong). The opium trade was legalized and Christians were granted full civil rights, including the right to own property, and the right to evangelize. Two weeks later, Ignatiev forced the Qing government to sign a "Supplementary Treaty of Peking", which ceded the Maritime Provinces east of the Ussuri River (forming part of Outer Manchuria) to the Russians, who went on to found the port of Vladivostok between 1860–61. The Anglo-French victory was heralded in the British press as a triumph for British Prime Minister Lord Palmerston, which made his popularity rise to new heights. British merchants were delighted at the prospects of the expansion of trade in the Far East. Other foreign powers were pleased with the outcome too, since they hoped to take advantage of the opening-up of China. The defeat of the Qing army by a relatively small Anglo-French military force (outnumbered at least 10 to 1 by the Qing army) coupled with the flight (and subsequent death) of the Xianfeng Emperor and the burning of the Summer Palaces was a shocking blow to the once powerful Qing Empire. "Beyond a doubt, by 1860 the ancient civilization that was China had been thoroughly defeated and humiliated by the West." After the war, a major modernization movement, known as the Self-Strengthening Movement, began in China in the 1860s and several institutional reforms were initiated. The opium trade incurred intense enmity from the later British Prime Minister William Ewart Gladstone. As a member of Parliament, Gladstone called it "most infamous and atrocious", referring to the opium trade between China and British India in particular. Gladstone was fiercely against both of the Opium Wars, was ardently opposed to the British trade in opium to China, and denounced British violence against Chinese. Gladstone lambasted it as "Palmerston's Opium War" and said that he felt "in dread of the judgments of God upon England for our national iniquity towards China" in May 1840. A famous speech was made by Gladstone in Parliament against the First Opium War. Gladstone criticized it as "a war more unjust in its origin, a war more calculated in its progress to cover this country with permanent disgrace". 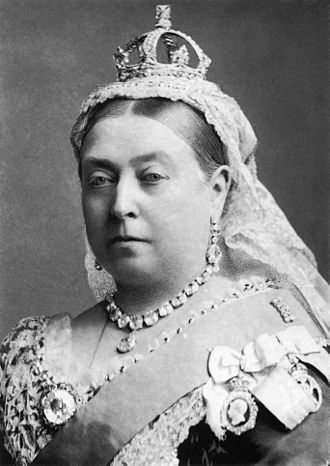 His hostility to opium stemmed from the effects of the drug upon his sister Helen. 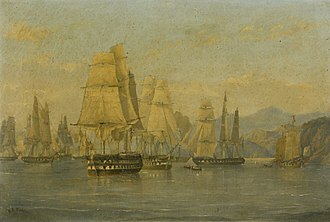 Due to the First Opium war brought on by Palmerston, Gladstone was initially reluctant to join the government of Peel before 1841. 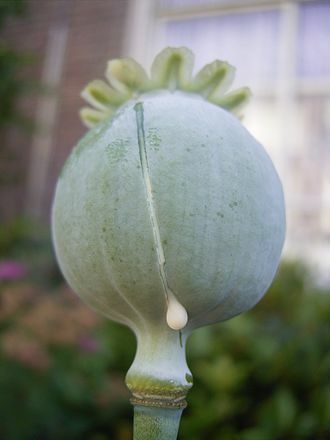 ^ a b "Opium Wars". www.mtholyoke.edu. Retrieved 2018-09-04. ^ Hanes & Sanello 2004, pp. 176–77. ^ a b c d e f g h Wong, J. Y. Deadly Dreams: Opium and the Arrow War (1856–1860) in China. ISBN 9780521526197. ^ a b "Bombardment at Canton". Morning Journal. 19 January 1857. p. 3. ^ David, Saul (2007). Victoria's Wars: The Rise of Empire. London: Penguin Books. pp. 360–61. ISBN 978-0-14-100555-3. ^ Hsü 2000, p. 206. ^ Hevia 2003, pp. 32–33. ^ "The Anglo-French Occupation of Canton, 1858–1861" (PDF). Royal Asiatic Society Hong Kong Branch. ^ Hsü 2000, p. 207. ^ Ye Shen, Shirley; Shaw, Eric H. "The Evil Trade that Opened China to the West" (PDF). p. 197. Archived from the original (PDF) on 3 December 2011. Retrieved 21 September 2014. ^ Hsü 2000, p. 212–13. ^ China: Being a Military Report on the North-eastern Portions of the Provinces of Chih-li and Shan-tung, Nanking and Its Approaches, Canton and Its Approaches: Together with an Account of the Chinese Civil, Naval and Military Administrations, and a Narrative of the Wars Between Great Britain and China. Government Central Branch Press. 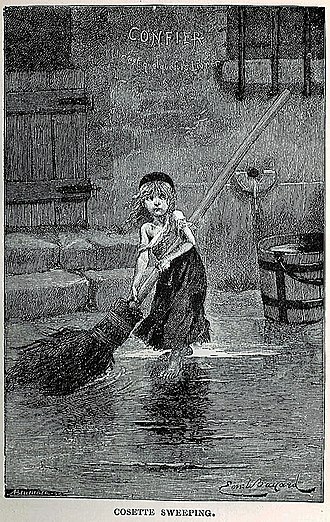 1884. pp. 28–. ^ Hsü 2000, pp. 214–15. ^ Hsü 2000, p. 215. ^ a b Endacott, G. B.; Carroll, John M. (2005) . A biographical sketch-book of early Hong Kong. Hong Kong University Press. ISBN 978-962-209-742-1. ^ Hsü 2000, p. 219. ^ Peter Ward Fay (9 November 2000). The Opium War, 1840-1842: Barbarians in the Celestial Empire in the Early Part of the Nineteenth Century and the War by which They Forced Her Gates Ajar. Univ of North Carolina Press. pp. 290–. ISBN 978-0-8078-6136-3. Bickers, Robert A. (2011). The scramble for China: foreign devils in the Qing empire, 1800–1914. London: Allen Lane. ISBN 9780713997491. Ringmar, Erik (2013). Liberal Barbarism: The European Destruction of the Palace of the Emperor of China. New York: Palgrave Macmillan. Wong, J. Y. (1998). Deadly dreams: opium, imperialism, and the Arrow War (1856–1860) in China. Cambridge; New York: Cambridge University Press. ISBN 0521552559. The Xianfeng Emperor, personal name I-ju, was the ninth Emperor of the Manchu-led Qing dynasty, and the seventh Qing emperor to rule over China, from 1850 to 1861. Yizhu was born in 1831 at the Old Summer Palace, eight kilometres northwest of Beijing and he was from the Manchu Aisin Gioro clan, and was the fourth son of the Daoguang Emperor. His mother was the Noble Consort Quan, of the Manchu Niohuru clan, who was made Empress in 1834, and is known posthumously as Empress Xiaoquancheng. Yizhu was reputed to have an ability in literature and administration which surpassed most of his brothers, which impressed his father, yizhu succeeded the throne in 1850, at age 19, and was a relatively young emperor. He inherited a dynasty that faced not only internal but foreign challenges, yizhus reign title, which means Universal Prosperity, did not reflect the situation. In 1850, the first of a series of popular rebellions began that would destroy the Qing dynasty. The Taiping Rebellion began in December 1850, when Hong Xiuquan, Hong proclaimed the establishment of the Taiping Heavenly Kingdom and the rebellion spread to several provinces with amazing speed. The following year, the Nian Rebellion started in North China, the Qing imperial forces suffered repeated defeats at the hands of both rebel movements. In 1853, the Taiping rebels captured Nanjing and for a while it seemed that Beijing would fall next, but the Taiping northern expedition was defeated and the situation stabilized. The Xianfeng Emperor dispatched several prominent mandarins, such as Zeng Guofan and the Mongol general Sengge Rinchen, to crush the rebellions, the biggest revolt of the Miao people against Chinese rule in history started in 1854, and ravaged the region until finally put down in 1873. In 1856, an attempt to regain Nanjing was defeated and the Panthay Rebellion broke out in Yunnan, meanwhile, an initially minor incident on the coasts triggered the Second Opium War. Anglo-French forces, after inciting a few battles on the coast near Tianjin, the Xianfeng Emperor, under the influence of his Noble Consort Yi, believed in Chinese superiority and would not agree to any colonial demands. The Third Battle of Taku Forts was an engagement of the Second Opium War, part of the British and French 1860 expedition to China. It took place at the Taku Forts near Tanggu District, approximately 60 kilometers southeast of the city of Tianjin, sir Hope Grant was the British commander with Lt-Gen. Charles Cousin-Montauban, Comte de Palikao in charge of the French, the force consisted of about 400 men,200 British and 200 French. 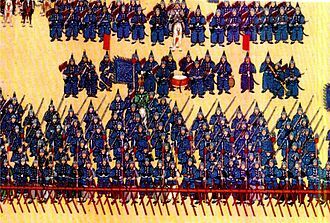 Hundreds of Qing Army troops garrisoned the Taku Forts, at least forty-five artillery pieces were among the Chinese defenders, the reports would determine the strategy for the next attempt. The conclusion of the Indian Mutiny had released troops to reinforce the Hong Kong station, not wanting to have a repeat of the 1859 disaster, on 30 July 1860 the Anglo-French army began landing at Beitang 10 miles to the north of the Forts. A few days a reconnaissance force moved towards the Taku Forts for close observation, the whole force was ashore by 7 August and a few days on 12 August, the allied force advanced. Pushing back enemy forces in front of them, including ~2,000 cavalry, there were four, two on the north and two on the south side. The French wanted to attack the forts, but the survey by Fisher indicated that the key was the main northern fort. On 17 August his plan was adopted, five batteries were established during the night of 20–21 August with fascines made using the straw walls and roofs of nearby barracks. Battery -6 x French field-pieces and 1 x 8-inch gun Battery -3 x 8-inch mortars this battery platform was made from coffin lids which were 6 inches thick. Battery -2 x 32-pounders and 2 x 8-inch howitzers Battery -2 x 8-inch guns Battery -6 x Armstrong guns Opening fire next morning, the major assault took place on the main Chinese fort. Attacking as two columns, one British and one French, heavy fighting ensued as the attackers crossed several Chinese ditches and spiked bamboo palisades. Few managed to enter via this route, the main attack was therefore made against the walls using the ladders. Yixin, better known by his title Prince Gong, was an imperial prince of the Aisin Gioro clan and an important statesman of the Manchu-led Qing dynasty in China. He was the son of the Daoguang Emperor, a half-brother of the Xianfeng Emperor. At a young age, he was noted for his brilliance and was once considered by his father as a potential heir. However, his brother, eventually inherited the throne. In the aftermath of the Second Opium War in 1860, Prince Gong concluded negotiations with the British and Russians, after the coup, he served as Prince-Regent from 1861–65 and presided over the reforms implemented during the Tongzhi Restoration. Yixin was born in the Aisin Gioro clan, the clan of the Manchu-led Qing dynasty. He was the son of his mother, Imperial Noble Consort Jing. He studied in the library and practised martial arts with his fourth brother. He created 28 qiang movements and 18 dao movements, which were respectively named Lihua Xieli and his father gave him a White Rainbow Sword as a gift. Yixin was mentored by Zhuo Bingtian and Jia Zhen, two eminent scholar-officials who obtained the position of jinshi in the examination in 1802 and 1826 respectively. According to the edict, the Fourth Prince, would become the new emperor while Yixin, Yizhu ascended the throne in 1850 after the death of the Daoguang Emperor and adopted the regnal title Xianfeng, he is thus historically known as the Xianfeng Emperor. In accordance with their fathers secret edict, the newly enthroned Xianfeng Emperor granted Yixin the title Prince Gong of the First Rank in the same year. In October 1853, as the Taiping rebels closed in on Jinan, Prince Gong was appointed to the Grand Council, the following year, he received three additional appointments, you zongzheng and zongling. He was publicly praised in May 1855 after the Taiping rebels were driven out of Jinan, Prince Gong was still permitted to enter the inner imperial court and the imperial library. He was restored to his position as a dutong in June 1856, the Anglo-French delegation, which included Harry Smith Parkes and Henry Loch, were taken prisoner by the Mongol general Sengge Rinchen during the negotiations. The Second Battle of Taku Forts was an Anglo-French attack against the Taku Forts along the Hai River in Tianjin, China, in June 1859 during the Second Opium War. A chartered American steamship arrived on scene and assisted the French, Taku is a village near the mouth of the Pei-ho River, which flows between low, muddy banks and runs into the Gulf of Pe-cho-li. Thirty-four miles above the river is Tientsin, constructed at the fork of the Pei-ho with the Grand Canal, Tientsin is the port of Peking and a place of much commerce. Peking is the capital of China and is about eighty miles above Tientsin, a British fleet, under the command of Admiral James Hope, escorted them for protection against the Chinese fortifications. They had learned that they might be opposed, so prepared themselves, the Admiral was informed that these had been placed on the river to keep out pirates and it was promised by the Chinese government that they would be removed. Despite the promise, the local Mandarins began to work on strengthening the defenses of the river. Three days of peace passed and the Chinese failed to remove their defenses so the Anglo-French fleet began to prepare for battle, at high water, this spike would be a few feet below water. The spikes were positioned so that they could pierce through the hull of a coming up the river at high tide. Hope had several ships in his squadron, none of these could take a direct part in the coming fight though. Because of this, the British could only rely on steam powered gunboats for the actual fight against the Chinese forts. The Royal Navy gunboats were small wooden steamers of light draft built during the Crimean War for service in the waters of the Baltic. Admiral Hope crossed the bar with his boats and anchored below the forts on the June 23. The gunboats were, HMS Plover, HMS Banterer, HMS Forester, HMS Haughty, HMS Janus, HMS Kestrel, HMS Lee, HMS Opossum, HMS Nimrod and HMS Cormorant, both of six guns, were present. Each of the gunboats had a crew of fifty or sixty officers and men. The more heavily armed steamers, outside the bar, were to offload another 500 or 600 men and sailors via steam launches, boats. General Sir James Hope Grant, GCB, was a British Army officer. 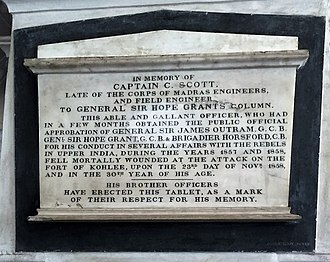 He served in the First Anglo-Chinese War, First Anglo-Sikh War, Indian Rebellion of 1857, Grant was the fifth and youngest son of Francis Grant of Kilgraston and brother of Sir Francis Grant, President of the Royal Academy. He was uncle to sculptor Mary Grant and he entered the British Army in 1826 as cornet in the 9th Lancers, and became lieutenant in 1828 and captain in 1835. In 1842 he was brigade-major to Lord Saltoun in the First Opium War, and distinguished himself at the capture of Chinkiang, after which he received the rank of major and the CB. There is a popular, possibly apocryphal, story that he was selected by Saltoun because he wanted a cellist to accompany him and he was promoted brevet lieutenant-colonel and shortly afterwards to the same substantive rank. In 1854 he became brevet-colonel, and in 1856 brigadier of cavalry and he took a leading part in the suppression of the Indian Rebellion of 1857, holding for some time the command of the cavalry division, and afterwards of a movable column of horse and foot. 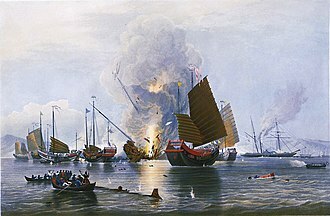 The Battle of Canton was fought between British and Chinese forces at the city of Canton, Guangdong province, China on 23 October to 5 November 1856 during the Second Opium War. On 23 October, British operations began with the attack on four known as the Barrier Forts in the Pearl River. The Coromandel and Barracouta captured the forts with slight opposition, the first shot in the war being fired from the Coromandel, rear-Admiral Michael Seymour, commander-in-chief of British forces in China, reported no British casualties and four or five Chinese killed due to an ill-judged resistance. Afterwards, Seymour proceeded to Canton, where he found the Encounter moored off the city near the Canton Factories and he sent the Sampson and Barracouta to secure the free navigation of Blenheim Reach along the river. Both ships took possession of the Blenheim and Macao Forts without resistance, the next morning, Seymour proceeded down Macao Reach where he met the Barracouta. The Dutch Folly Fort opposite the factories and Birds Nest Fort were taken possession of. The captured guns were rendered unserviceable, a detachment of Royal Marines was landed to protect the factories, reinforced by another party and some bluejackets. Advanced posts and field guns were stationed at the most important points, on 25 October, Chinese forces attacked the pickets but were repulsed by the Marines with a loss of 14 Chinese killed and wounded. On 26 October, operations were halted, being a day of rest on Sunday. At 1 pm on 27 October, the Encounter opened fire from its stern pivot at Governor Ye Mingchens compound in Canton, at the same time, the Barracouta in Sulphur Creek shelled the Chinese troops on the hills at the back of the city. 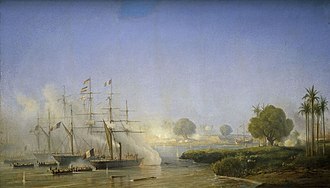 The British warned the inhabitants within the vicinity to evacuate themselves and their property, on 28 October, the British resumed offensive operations from the Dutch Folly, where they placed two guns in position. The next morning, the British resumed firing earlier than expected after the Chinese mounted guns opposite the Dutch Folly, at 2 pm, a detachment of about 400 marines and seamen, aided by the Dutch Folly guns, breached the city wall. Military encampments on Kowloon Peninsula in 1860, looking south toward Hong Kong Island. An Air France Boeing 747 passing above Kowloon, landing at the old airport. Hong Kong's old airport, Kai Tak, was located in Kowloon. Photo of a 27-year-old Prince Gong, taken by Felice Beato on 2 November 1860 after the signing of the Convention of Beijing. Photo of a 39- or 40-year-old Prince Gong, taken by John Thompson in 1872 at the prince's residence. Ye is captured by British armies and sent to a warship.